We have now been proud ex-battery hen keepers for over a week and our ladies are settling into their new home nicely. They've established their pecking order (Sandie is most definitely in charge) and have all mastered the art of using the ladder to get in and out of their coop. They know to put themselves to bed at dusk and are laying only in the nesting box (we're averaging three eggs a day). They have also been dust bathing and flapping their wings a lot which I love to see, seeing as it's unlikely they've been able to do either before. Three out of the six are already super inquisitive and friendly, happily coming over to us when we approach the run and even eating corn out of our hands! Four of them are still very bald but I can see new feathers already forming on them, and all of their combs are getting redder by the day! All in all, I like to think they're very happy in their new home and with their new keepers. And with a home like theirs, why wouldn't they be! After keeping hens in a wooden coop previously, I always knew I wanted an Eglu for my eagerly awaited ex-batts. On recommendation, I went for the Eglu Cube and run, which is the perfect size for six Rhode Island Red crosses. And I couldn't be happier with it! So what exactly is so special about the Omlet Eglu Cube, I hear you ask. Where do I begin! The cube is brilliantly designed, with a cosy separate nesting box that's accessible from three sides. There's the direct 'eggport' on the side which can be used to collect eggs, the rear panel door that gives access to the entire cube and a sliding door in-between the nesting box and the roosting bars that can be closed at night. The roosting bars are removable and easy to wipe clean, and sit over a slide out dropping tray that can be emptied straight onto your compost heap and hosed down. The door to the coop is opened and closed by a lift and twist handle, and there is a non-slip ladder for your hens to get in and out. 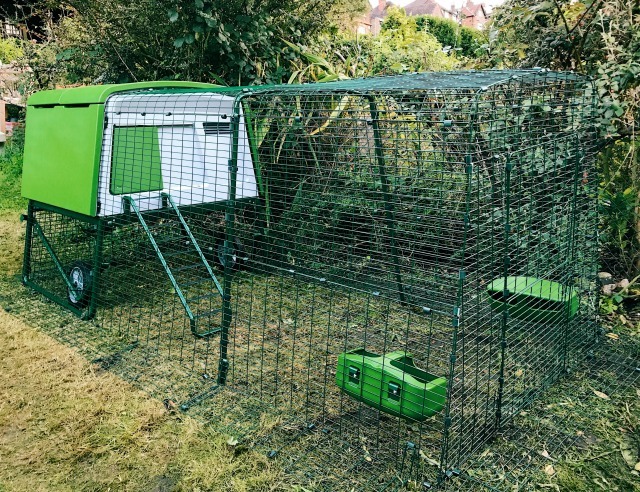 The cube is also on wheels, which means you can easily move it (as well as the run) to fresh patches of lawn whenever you want, plus it comes with absolutely everything you need - including food and water containers, a rain cover - and even some cute little boxes for those all important eggs! As well as being easy to move and easy to clean, the coop and run are both super sturdy, and fox proof to boot. There's a stable door to the run, which means you can half open it to replenish your hens' food and water, or fully open it to let them out / let yourself in! 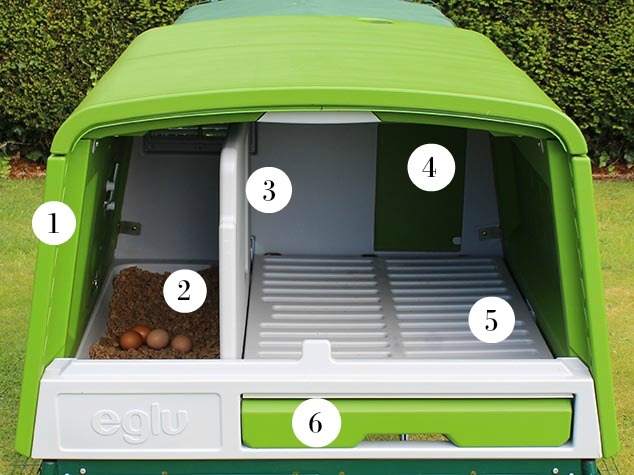 As someone who has previously kept chickens in a wooden coop, I can confirm that the Eglu is SO much easier to keep clean, and SO much more hygienic. I'm not going to lie - putting the run together was pretty tricky (the cube was totally fine). I'm not going to pretend that I did it myself either..... my Dad did it (I made him lots of cups of tea and held the odd bit in place when my services were required though, so I did help). The instructions said 3hrs to build the coop and run completely but it took a little longer than that. The end result was well worth it though! Overall? There's no denying Omlet products are expensive but in my opinion they're worth every penny. While researching them it became clear that they last a very long time and also retain their value when being sold second (or even third!) hand. They're extremely low maintenance, are 100% recyclable and look great. I contemplated making a video of the Eglu myself but there's no beating this one made by Omlet - press play to see all the brilliant functions in use. If you want to see footage of my ladies in their Eglu, take a look at my stories over on Instagram where they feature every day and are very entertaining to watch! Omlet | Discover the New Eglu Cube - Chicken Coop from Omlet on Vimeo. Prices for the Omlet Eglu start at £549 for the basic coop. Our model, which includes the stand and wheels as well as a 3m run, costs £849. DISCLAIMER: The lovely people at Omlet sent my incredibly lucky ladies their Eglu Cube and run for the purpose of this review and to enable them to live out their retirement in luxury after a pretty rough start in life. We are very grateful!